There’s a nursery rhyme which first appeared in publication in the late 18th century with which you may be familiar which goes something like this…Rub-a-dub-dub,/Three men in a tub,/And who do you think they be?/The butcher, the baker, the candlestick maker,/And all of them out to sea…Let me be the first to tell you that I am not a professional football coach. I make my living writing, to the extent I make a living at all, and on my radio show, The Long Version. The HC at HMS, Maurice Jesse, owns a painting company, and I believe the DC, Carl Banks, is a welder (none of this applies to Coach Stinson as he is a professional football coach). There have been nights where I felt like the staff on which I have committed my Fall afternoons had as much business coaching football as a butcher, a baker, or a candlestick maker. There are other times, however, where we might just be adequate. Last night HMS, and particularly some kids who acquitted themselves very well in a cross-town rivalry game which means everything in the town in which we all live, made the writer, painter, and welder look more like football coaches than butchers, bakers, or candlestick makers. 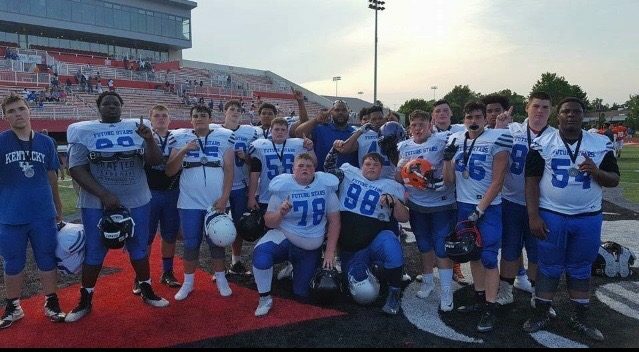 Hopkinsville Middle School, reeling from getting embarrassed at home by Caldwell County Middle School 24-12, bounced back last night and bested the Colonels 16-6 at the Stadium of Champions. 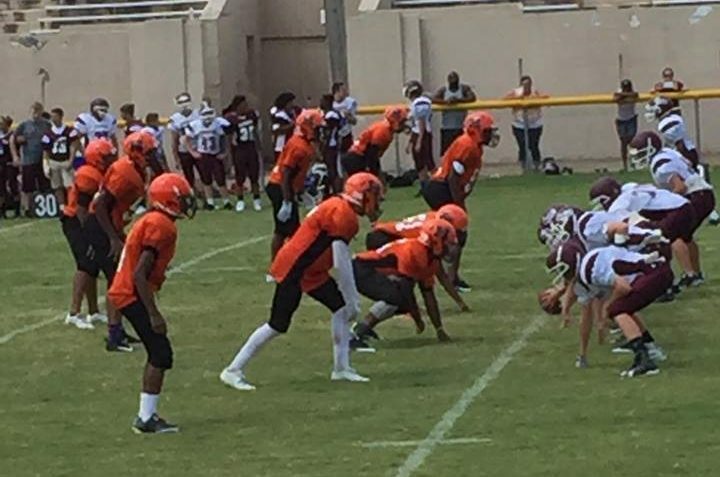 HMS was able to ride its offensive front to an effective ground game which was complimented well by timely passing out of QB Trevon Jefferson to receivers Cory Coleman and Dre’Shaun Richards. I thought the offensive line was particularly impressive both in providing pass protection and in permitting the offense to keep possession and eat clock with the lead. Lucas Hughes at Center last night was money. His calling of the blocking assignments, his snap, and his blitz pick-up were all money. I feel like, as his position coach, he grew up last night in front of my very eyes. If you don’t think executing a shot-gun snap is hard, you’ve never done it. You also haven’t watched a lot of football because that particular exchange is often an offensive issue at all levels of play. Just can’t run offense without it and, if executed well, like Lucas Hughes did last night, it, literally, makes the timing of the passing game a thing of beauty and permits teams to run well from the shotgun formation too. Jefferson and HMS were more consistent and effective throwing the ball last night and running from its Spread Formation because of Lucas Hughes, though the players may not even know that. Andrew Ludy was fantastic last night running the football and his contributions are worthy of specific notation. In my opinion, the player of the game last night was William Hughes. 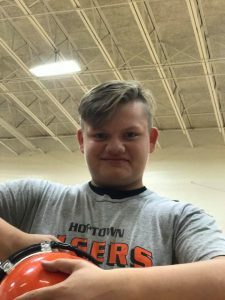 William is a 5’10” 240 pound, 2022 kid, who plays along both the offensive and defensive fronts. Offensively, he was a reliable presence behind whom HMS could run anytime it wanted as he was consistently blowing his assignment into the Defensive 2nd level all night. Defensively, he was in the offensive backfield so much he should have just joined the CCMS huddle. Why not? It was apparent to all onlookers, Hughes was coming back there, invited or uninvited. CCMS had no answer for Hughes as he constantly penetrated and made plays in the Colonel backfield putting Coach Gildersleeve’s offense in unenviable down and distance situations hard for any offense to convert. I also want to mention the play of Tyler Jones, who locked down his end pretty much all night and Preston Chaudoin, who came up and made several big-league plays in space from his safety/corner position and may have made the best open-field tackle all night in kick coverage, saving either a much bigger gain or touchdown. It should also be mentioned CCMS was quarterbacked for much of the night by an 11 year old who played his guts out in spite of his tender age. Joshua Keith, a six-grader at Millbrook Elementary School, played with the courage and composure one wouldn’t expect from a kid his age. He is a player we will be watching closely here at KPG, I can assure you. I can’t imagine what he will become once he is actually enrolled in a Middle School. Overall, it was a solid performance from a HMS team about whom it was fair to say there were obvious questions coming out of the Caldwell County debacle. For last night, at the very least, the butcher, the baker, and the candlestick maker didn’t appear too far out to sea. Yes Ma’am, he performed very well.